The knife world is plagued with fakes and frauds. People on eBay are trying to pass off $400 Sebenzas as real and sellers on Amazon are unknowingly selling fake CRKT and SOGs to unsuspecting customers. Because of all the tricksterism plaguing the knife community, I often get asked whether a knife is real or fake. While I recently wrote a guide on how to spot a counterfeit knife, it didn’t address another popular question — is my Damascus knife a fake? 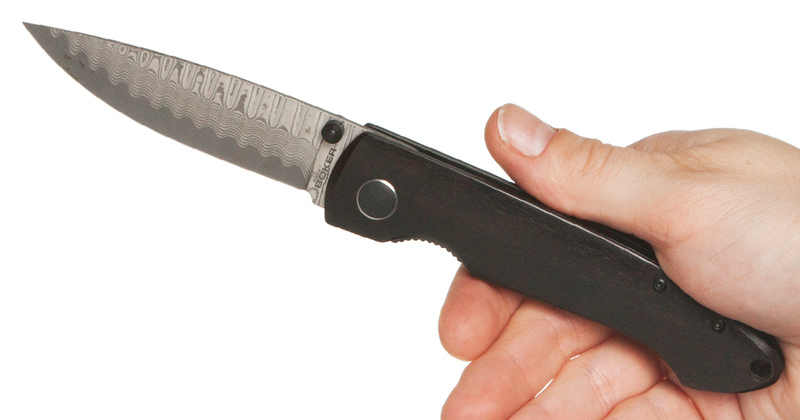 Damascus knives are becoming more popular and more prevalent from the most popular knife brands like Spyderco (with the Endura and others) to lesser known brands like BucknBear. What makes people even more confused about the legitimacy of Damascus steel is the vast price differences. Could a $50 knife with Damascus steel be real when you see other Damascus blades topping the $500 mark? Before determining whether your Damascus is fake or real, we should first define what Damascus actually is. Damascus is that wavy pattern in steel that looks exotic and downright gorgeous. I’m simplifying this a ton, but there are two ways to get “real” Damascus steel: Wootz and pattern-welded steel. The first real Damascus steel was introduced around the third century and was known by Wootz (and other names). It was a crucible steel that was made by melting pieces of iron and steel in clay pots. It’s produced by melting pieces of iron and steel with charcoal in a reducing atmosphere (lacking oxygen). During the process, the metals absorb carbon from the charcoal and the resulting alloy is cooled at a very slow rate. This produces a material with a visible crystalline structure of varying carbide contents. 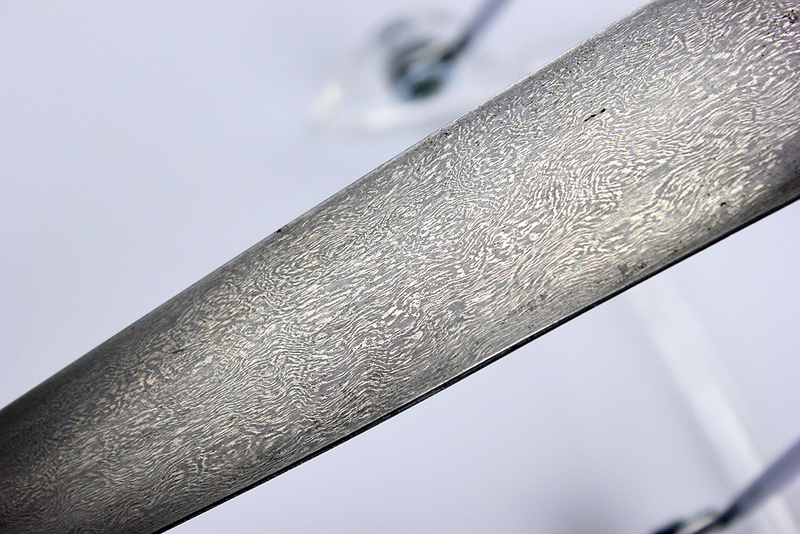 Forging the material into a desired shape (such as a sword blade) alters the crystalline structure into the familiar waving or watered pattern that Damascus steel is known for. This technique is extremely work intensive and requires a high degree of skill to keep the necessary temperatures constant throughout the process. This type of steel originated in India and was passed down by blacksmiths throughout the East. The steel was eventually introduced to Damascus, Syria. There are many theories why it is called Damascus, but we won’t go into it here. The true way to make Damascus this way was lost somewhere in the 17th century as those handed down the knowledge died out. People in modern times have mimicked the process and likely have come close to recreating the original Damascus. However, the soil composition and chemical properties of the steel used in the specific region make truly recreating that original Damascus likely impossible. This is what people these days call Damascus. It represents 99.9 percent of all the Damascus steel you see. This process involves forging two or more types of steel that complement one another and folding the steels together. Then, some acid etching is done to amplify the differences in the steel. This creates a wavy pattern that closely resembles the Damascus of old. Pattern-welded steel fell out of fashion for centuries before being brought back to modern times singlehandedly by the ingenious Bill Moran in the 1970s. You will also sometimes see knives that say VG-10 Damascus. In this process, there is a VG-10 core with Damascus steel on either side. The steel is laminated in the mold of San Mai, in which three layers of steel are sandwiched together. If you can’t wrap your head around what I’m talking about, watch this video from Walter Sorrells about the two types of “real” Damascus steel. So, Is My Damascus Blade Real? Some people still insist that any Damascus steel made through the pattern-welded method and etching is not real Damascus. Those people are simply wrong. If you have a Damascus blade that was made with pattern-welded steel and some acid etching, then you do indeed have a real Damascus blade. Considering pretty much every single knife on the market that says it’s Damascus is pattern-welded steel, it’s not a big deal. 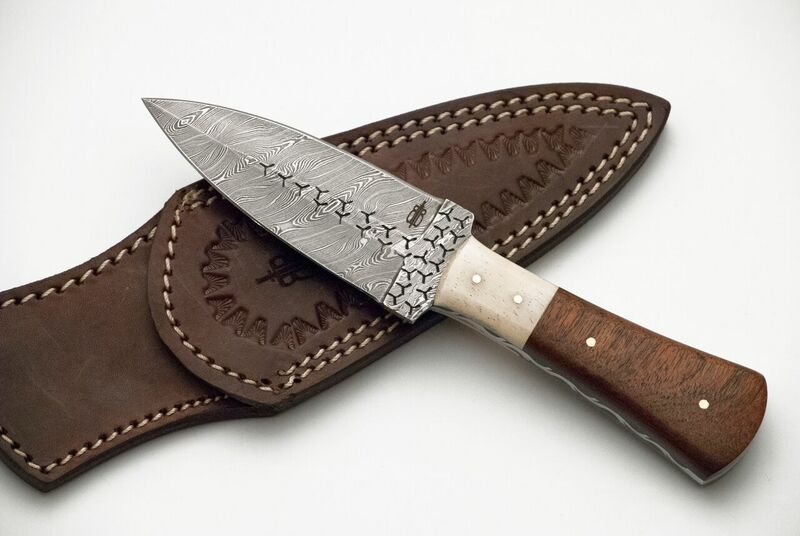 However, in some rare cases, people will try to pass off regular stainless steel with no layering as Damascus by printing a design on the blade. These are pretty easy to spot because they either don’t look like Damascus or the pattern could just rub off. Real Damascus is intrinsic to the steel itself but fake Damascus is only a facade. But many people still have concerns about the authenticity of their Damascus, so I’ll answer some common questions people have about the steel. Why Isn’t the Damascus Visible Everywhere on the Blade? A few years ago, I wrote a review of a BucknBear Damascus Hunting Knife. The comments are filled with people claiming that the knife I reviewed is a fake because you can’t see the pattern all over the blade. The Damascus pattern only exists on the main sides of the knife. No pattern shows on the edges or the back of tang, i.e., the area between two sides of the handle. True Damascus steel should be like those cakes that have colorful layers. No matter where you cut the cake, the surfaces show the pattern. There is a reason the pattern is not clearly visible on certain parts of a blade. Either the pattern was polished out after etching or it simply wasn’t acid etched. This video from BowieMaker shows how a Damascus blade does not look different than any other knife… until you dip it in acid for even a few seconds. But the truth is, you can see the pattern in the steel, just very lightly. If there is a part of the blade that is not etched, you should still be able to see the pattern, albeit lightly, in different light. I can see the pattern on the spine and file work of the BucknBear I have. It’s just not very visible. What is that Residue Coming Off the Blade? If you clean your Damascus blade you may notice some black residue coming off the blade. You may be thinking to yourself that this must be the print coming off. That’s probably not the case. That is likely residue from the acid etching. That does not mean you have a fake. Why is There a Huge Price Difference for Damascus? Oh, you got a Damascus steel folder for only $40? It must be a fake. Just like any other knife, Damascus varies in quality. 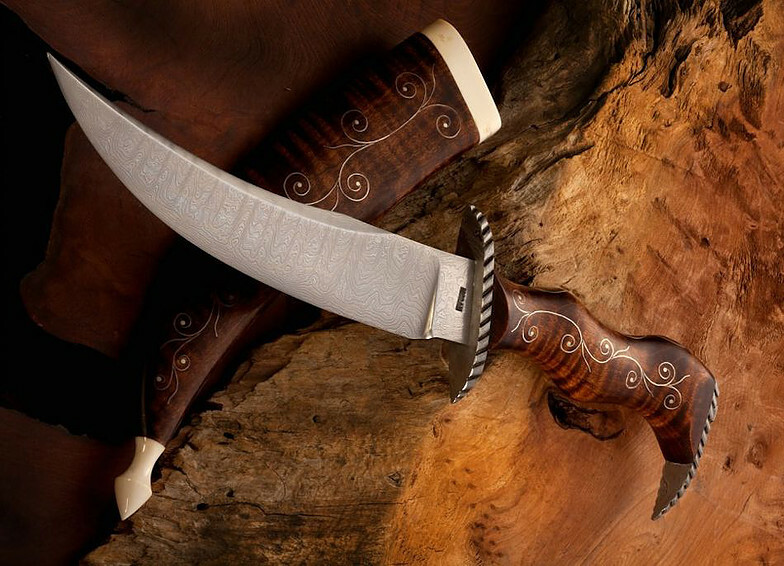 Damascus handmade by custom knife makers with a care and attention to detail will cost much more than knives made in Pakistan. 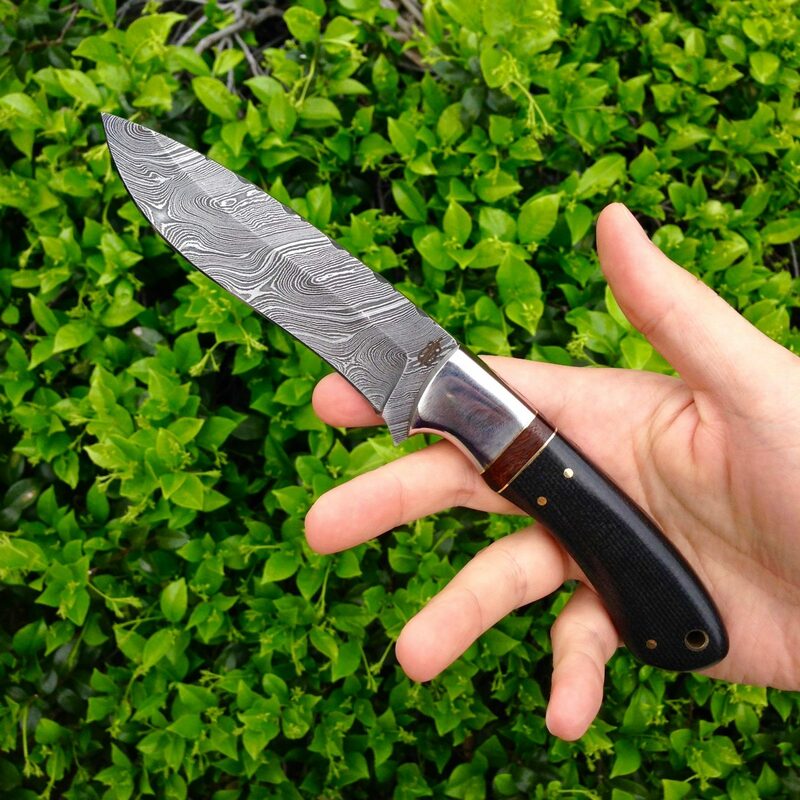 For example, BucknBear has become known for making some great Damascus steel knives at relatively cheap prices. I reached out to them to confirm that their Damascus is 100 percent real and that their knives come from Pakistan. Pakistan is a region known for making inexpensive Damascus blades. Even though the art of Damascus steel originated from that region, you can get some pretty poor quality knives if you don’t choose right. And just as with anything at cheaper prices, mileage may vary. However, a low cost does not necessarily mean a fake. Don’t buy off eBay, but if you do, don’t be surprised to see a Damascus fixed blade on there from Pakistan for a few bucks. Beware of quality control issues and worse. Of course, discerning the quality from junk is hard, especially when places don’t tell the steel used to make the Damascus. Why Do Patterns Look So Different (or the Same)? You can achieve these specific patterns by folding the steel and manipulating it in very specific ways. Probably the most popular pattern is the “random” pattern, which is why the Damascus may look different from one knife to the other. Either way, most Damascus has its own personality and look. How Do I Really Tell If I Have a Fake? If you’re really adamant on knowing whether your Damascus is real or fake, the only real way to tell is to completely polish the pattern out of the blade. You can use sandpaper to get that satin look. Once it’s nice and polished, etch it with ferric chloride or muriatic acid. If the Damascus pattern comes back, it’s real. If not, you have a fake on your hands. Because Damascus can be done the real way pretty cheaply, finding a fake Damascus is rarer than you might think. Still, it’s always good to be informed and aware of what to look for. I beg to differ, IMHO, what we have here is Pattern Welded Steel, which is good but those who think that they have the original Damascus Steel, they are simply wrong. They are wrong for the reasons that you mentioned, the technique for making it was LOST (Or they did not have the same impurities in the material that they had before.). You said it yourself. However, the main difference between what we have now and what they had then is that the real, Original, Damascus Steel has Nanotubes and nano filaments in it, which were responsible for the steels incredible strength. I continue to stress this point, because, while I’m sure that all appreciated the look of the steel, it was the strength in battle that made the difference. If you are honest you will also chose the strength over the look, any day, and especially if your life depended on it. where do you recommend buying online ? Wootz is not real Damascus. It just a modern day attempt to make it. The original way that actually produced the insanely strong blades were lost, and it ONLY works with ore from one specific mine in Pakistan, due to having the correct components in it. I agree to a certain extent and covered all of what you said in the post. However, these days, real Damascus is essentially pattern-welded steel now. I bought a Mini Damascus knife on Gearbest for about 12 dollars.Do you think it’s fake ? It’s impossible to say without actually seeing it, but there’s a very good possibility it’s a fake. I bought three “Japanese Damascus “ paring knives Made in China from a seller on eBay. It is clear to me that they are imitation Damascus using a cheap etching. If the etching washes off pretty easily, then that means you should be able to re-etch it as well. You can etch them yourself with ferric chloride or muriatic acid to see if the pattern reemerges. What if the sharpened edge doesn’t show a pattern? Is that a sign of a fake? Not necessarily. Because the edge is sharpened, the acid-etching fades to become nearly invisible. If you re-etch it, it should be visible. It’s also possible that the blade is San Mai, which is laminated.